TUSCALOOSA, Ala. — All Alabamians are encouraged to get outside and walk, run, hike, bike, swim, paddle, ride, or roll with family and friends at the state’s parks, nature preserves, and rivers through the 100 Alabama Miles Challenge. A new statewide public program presented by The University of Alabama Center for Economic Development and partnering organizations, the Challenge officially starts Saturday, May 12 with kick-off events in several cities and towns throughout the state and at all 17 Alabama State Parks. The largest event will take place at Railroad Park in Birmingham May 12 at 9 a.m., and it will feature celebrity spokesperson Noah Galloway, a veteran of the United States Army, an extreme race competitor, and a motivational speaker who was recently a contestant on Dancing with the Stars. Galloway will lead attendees on a one-mile walk around Railroad Park as a symbolic “first mile” of the challenge for 2018. Also at the Railroad Park event will be the National Institutes of Health’s All of Us Journey, a traveling, hands-on exhibit to raise awareness about the All of Us Research Program—an ambitious effort to gather data from 1 million or more people living in the United States to accelerate research and improve health. 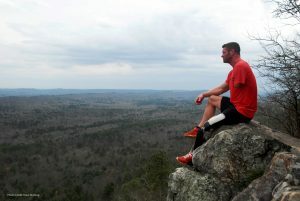 Noah Galloway, US Army veteran, an extreme race competitor and a motivational speaker, will lead participants on a one-mile walk around Birmingham’s Railroad Park as a symbolic “first mile” of the challenge. Organizers invite the public to register for the 100 Alabama Miles Challenge at 100alabamamiles.org, where they will earn electronic badges for milestones they reach and places they visit as they log their miles of activity. The website enables participants to find recreational trails throughout the state, track their progress individually and by teams, and to get important safety and wellness information before they head outside. Participants can take the challenge with friends and family, have friendly competitions with others, and share their experiences through the program’s social media platforms. Participants in the 100 Alabama Miles Challenge can use the #100ALMiles hashtag to share photos and experiences across social media as they rack up their mileage. “Through close partnership between UACED, Alabama Trails Commission, Blue Cross and Blue Shield of Alabama, Lakeshore Foundation, Jefferson County Department of Health, Governor’s Commission on Physical Fitness and Sports, Alabama Beverage Association, AARP, Alabama Department of Public Health, and Alabama Obesity Task Force, we have developed a fun and engaging program that we think everyone will want to participate in, regardless of their age or ability,” Rushing said.